The future cities exhibition at The Crystal building points out a startling truth early on: half the world’s population lives in cities, and by 2050 this number will have risen to 70%, something like 6.5 billion people. Every second another two people move to a city. How are cities are developed, and how we travel about them is therefore of extreme importance. The free exhibition has eight zones, but the one of most interest to me was ‘Keeping Moving’, looking at aspects of public transport in future. A statistic on one of the many interactive screens reported that keeping Cairo moving led to 234 road accidents a day, with 1 death and 25 injuries every 13 hours. It will be no surprise to learn that mobility about cities is most easily achieved in the well-developed cities of Europe and North America. Those cities struggling to cope are in turn those less-developed cities in Asia and Africa. 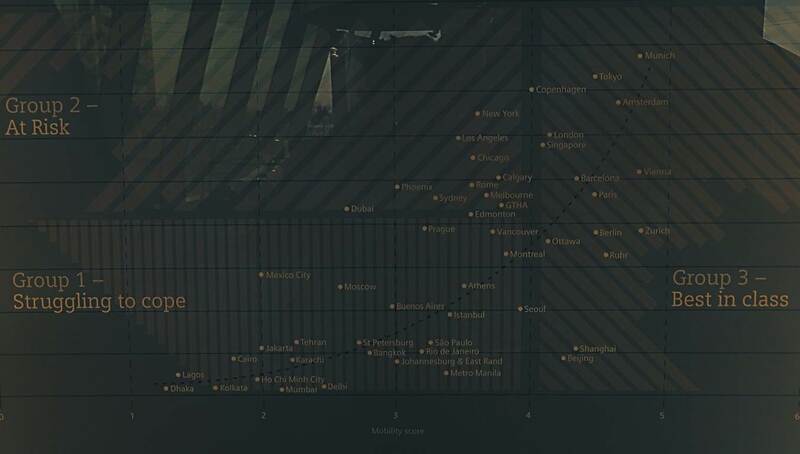 Cairo finds itself with one of the lowest scores on the displayed graph of ‘complete mobility index’ (towards the left hand side), an index that takes into account all forms of transport. The same screen that reported Cairo’s accident statistics reports 50,000 taxi drivers in Cairo replacing belching taxis for modern vehicles using cleaner liquefied natural gas. One of the things the Keeping Moving zone does best is highlight (to children) our continued reliance on dirty fuels. A clever gadget enables visitors to calculate their carbon dioxide emissions in reaching the exhibition. My local trip by train, light railway, cable car, and foot had resulted in the release of a shocking sounding 5 kg of CO2. Compared to other visitors I was doing well. The average visitor CO2 expenditure was 79 kg. It was just a shame the exhibition was so empty.